Hello there - my name is Brian Huang and I graduated last spring from UCLA with a major in Biology. During my last two quarters, I worked on a honors senior thesis with Tina and Dan studying dominance in marmots. Using six years of interaction data collected by the very hardworking marmoteers, we examined whether body condition (size) influenced dominance, and whether dominance in turn influenced reproductive success and dispersal. Several dominance matrices and linear models later, we found that marmots in better body condition were more dominant and produced more offspring. In addition, higher ranking males had greater reproductive success than those of lower rank. Dominance had no influence on yearling dispersal, but individuals in better body condition were less likely to leave the natal territory. This project really helped me realize the importance of each social interaction between marmots. Because marmots spend most of their time doing other things, such as foraging or avoiding predation, these relatively rare interactions can potentially be quite revealing. Each interaction can offer greater insight and better define marmot sociality. It would be interesting to see whether these patterns still apply many decades later. As the environment changes, many species, including marmots, may adapt new behaviors to adapt to their evolving surroundings. But for now, I suppose size matters after all! Look out for our paper on this study later this year in Ethology! Outside of marmot research, I have also participated in other field research as a student of the Field/Marine Biology Quarter (FMBQ). In the fall of 2009, I traveled to the US Virgin Islands to study the effects of ecotourism (primarily camera flashes and shutter noises) on tropical lizards. In other words, my group-mates and I ran around the islands scaring every other lizard in sight. Here is a picture of me searching for those poor, unsuspecting lizards. For any undergrads reading this blog, I highly recommend participating in a FMBQ if you have the opportunity. It was one of the most defining and rewarding experiences of my undergrad career. And the tropical destination wasn't too bad either :) ! Hello! My name is Rachel Stafford-Lewis and I am currently a sophomore undergraduate student majoring in Biology here at UCLA. 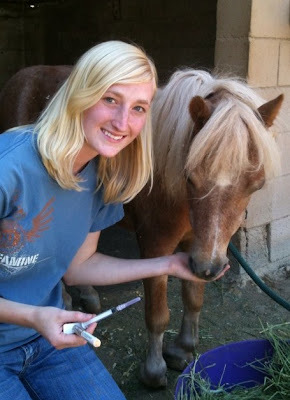 As exemplified by the picture above of me with a horse, I am a huge animal person. Because of this and because of my interest in pursuing research, I was ecstatic when asked to join “team marmot” to assist with their research this quarter. I had actually never heard of a marmot before this opportunity and I have come to realize that they are adorable creatures with intricate social networks that interact much like you and me. My job will be to decipher these various social interactions and, more specifically, to analyze the maternal effects on these social networks. For now, I am doing computer-based analyses (see below), which includes creating dendrograms from the past year’s data collection in the field and assigning individual marmots to specific groups. Once I am acquainted with the each marmot’s social behaviors, I will investigate the factors shaping variation in the social interactions among individual marmots. In the future I hope to travel with my fellow RMBL researchers to the Rocky Mountains so I can aid in the study of these magnificent creatures. The study of these particular marmots has been multi-generational and has been the basis of our research for many years, so I am thrilled to get hands-on experience, and learn from the best! This groundhog day, marmots take center stage. Please join us in celebrating this occasion by checking out this story in the Washington Post and a special featurette below about the marmots at RMBL. This featurette was produced as part of the 15th Anniversary Edition release of the film Groundhog Day. Meet the researchers, see the field site and learn some interesting facts about marmots along they way.